The first week of the month is always busy for me as I work on getting Stamp of the Month Club packages mailed out and make and take kits and thank you cards for everyone that ordered the previous month. This month is a little crazier because I need to get it all done before we leave for our family vacation on Sunday! So today, I'm going to keep it short and sweet and share 5 projects created by fellow demonstrators that were swapped and displayed on the Hawaiian Incentive Trip. I've already CASEd this first one created by Lorri Heiling. I ran into Lorri when she was turning in her swaps. She always creates gorgeous cards and this one was no exception! 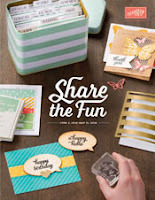 I plan to make a Double Slider Card for an upcoming Stamp of the Month Club series, so stay tuned for a video tutorial!